JazzTimes: How did this project come about? 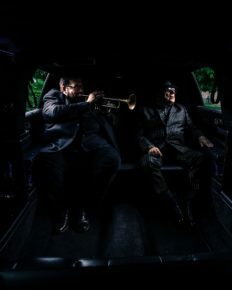 Joey DeFrancesco: Van’s manager emailed my manager: “Van was wondering if Joey would be interested in doing some recording.” And, of course, we were like, “Sure, that’s great.” I’d met Van a couple of times. The first time I met him was in 1994, at the Cork Jazz Festival in Ireland, because we opened for him. I was playing with John McLaughlin and Dennis Chambers at the time. It was a brief meeting. The second time was in 2014 at Ronnie Scott’s. I was playing there and he came out and he hung out. We talked a little bit—he really dug the music, you could tell. He loves music; he’s just all about it. And here we come to last year around this same time, and that email came in. That’s how it all started, and it turned into not just doing some recording but co-producing and co-leading this project with him. Van is known for being a bit of a curmudgeon, but it doesn’t sound like you experienced that at all. Yeah, he was 100-percent cool. We love a lot of the same music, we were influenced by a lot of the same things, and we just really hit it off musically. How familiar were you with his back catalog? Well, most of us are, right? A lot of that music is on the soundtrack to our lives. There are the obvious hits—“Brown Eyed Girl,” “Gloria,” those kinds of things—but the record that I really dug a lot is Astral Weeks. Everybody does. It was done in 1968, and that’s when you really hear his more harmonic approach. But he did a lot of great records. He had some beautiful records in the ’80s, too. I was pretty familiar with his stuff. I mean, everybody knows Moondance, right? You leave some outtake conversation in there. But even if I hadn’t heard him laughing at the end of a take, I’d say that it really sounds like he’s having a ball singing with you guys. Yeah, we all did. We had so much fun—it just got more and more fun. And each and every tune on there is one take. We didn’t do any second takes. There might’ve been a couple “Stop—let’s pick it up again” kinds of things, but there’s no other takes. And it was like doing a gig; he sang right there live in the studio with us. I did all the arrangements. He didn’t even hear any arrangements before we did them. I said, “Van, do you want to hear this before we do it?” The ideas—he’d hear about five minutes and say, “Yes!” He’d like it, and we would do it. And I said, “Just sing the melody like you would, man, and we’ll do our thing underneath you.” We just had a ball. He was having so much fun over there, laughing and carrying on. We did 15 tunes in two days. It was just one of those things that was meant to happen. How familiar was he with your stuff? He was very familiar with my catalog. Very. That was unbelievable. You expect us to be familiar with his, of course. But he’s such a music lover. He goes into it. He’s calling tunes: “Well, I like this record, or this song off of that record.” He really got into this stuff. As musicians, when we get into something, we dive in and we live, breathe, eat, sleep, walk and talk that thing. And he does. He digs in, and he loves it. And all of the other tunes, they’ve got that vibe. Like with the title cut, we finished the first eight songs and “You’re Driving Me Crazy” wasn’t on the list. There were a couple of tunes that were not on the list. When we were done with the first day’s session, we were having dinner later, and the phone rings and it’s Van and he says, “This project is—I’m over the moon for this, I love this, I love everything that’s happening, it’s so exciting. What do you think about ‘You’re Driving Me Crazy’?” I said, “Oh, that’s a great tune, man.” And then he said, “I’m going to throw you a curveball”—because I knew every tune he was calling. He said, “What about ‘Miss Otis Regrets’?” I was like, “What is that?” And then he says, “It’s actually a Cole Porter tune.” It’s a murder ballad. This was during dinner, so we got the chords and the tune down. I called my saxophone player [Troy Roberts] and said, “Troy, we’re going to play this tune.” And Troy is fast. The next day he had our chords written out and our tune. We went in the studio, laid them down, one take. Everybody was like, pow! Then he started calling other tunes. He’d say, “What about ‘The Things I Used to Do’?” I’d go, “How do you want it, Van? You want it like a shuffle, blues, how?” Then we’d start and he’d say, “No, no.” I’d say, “What do you want? Like [Jimmy] Witherspoon, where you swing it and you sing it like straight-ahead blues?” “Yeah! That’s it,” he said. And then he’s just ready to do it. You discuss something, and then you just go. And I mean—boom! Once we figured that out, it was great. We probably could have made 10 records. He was talking about, “Let’s do Volume Two! Let’s do Volume Two!” Who knows? Maybe we will. I love what you guys did to “Have I Told You Lately.” It’s a beautiful ballad of his that sounds like a Great American Songbook tune. But you guys sped it up to a hard-swinging thing. He had been doing that on his live gigs like that. But they were doing it more like a Louie Prima kind of a thing, like [sings the Prima rhythm]. I didn’t like that, because that’s how they do it, and you’ve got to do something different. So we just swung it a little bit faster, and it came out great. And I love the way we did “Close Enough for Jazz,” but we did it completely differently. I put Charlie Parker lines in there in the arrangements and stuff. Real fast bebop lines. This is probably his first really bona fide jazz album. You’ve done some records with vocalists, like that album with Joe Pesci [2003’s Falling in Love Again], but this one is on a different level. In fact, Van really liked that record. He loved the arrangements behind Joe. He liked Joe’s singing, too. He’s a Jimmy Scott fan, so if you’re a Jimmy Scott fan, it’s kind of automatic, right? But I did a record years ago with Janis Siegel [2003’s Friday Night Special]. It was her record and I was on it. And [there was] different guesting on a lot of stuff with Diana Krall and Nancy Wilson. But a whole record of this with my band, with my arrangements, co-producing? It was a whole other level. And it was really a lot of fun and a real honor to do it.